Successfully Added Rofvape Mod Kit A Box Mini - 80W, 100 to 300 Degree C Temp Range, Overheat Protection, VW + VT Mod (Silver) to your Shopping Cart. The A Box mod kit from Rofvape is part and packs a 7 to 80Watt output range and has adjustment controls in 0.5W steps. Made from a zinc alloy this complete mod kit can be controlled from a 200 to 600 degrees Fahrenheit temperate range and with its 510 connection thread, this mod should work with other atomizers and tanks. 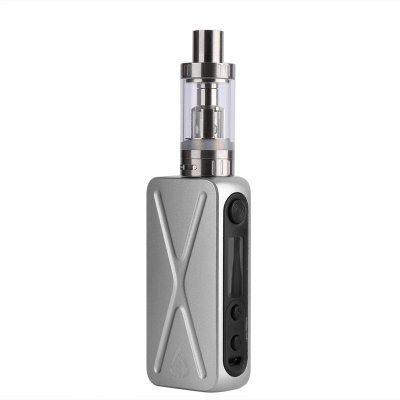 Designed to be powerful yet lightweight the A Box Mini 80W vape kit is very portable and exceptionally versatile. It works in VW as well as VT modes with VT-TI/VT-NI/VT-SS modes all available at the touch of a button. There is even a memory mode that will keep the wattage and operation mode of the previous usage. To the side of the mod is a small display with readings for the battery level, current resistance, and temperature mode. To ensure these don't get changed inadvertently there is a lock and unlock mode and plenty of other safety features are built in as well such as 10 seconds over time protection, short circuit protection, overheating protection, low battery protection, dry burn protection and more. The clearomizer, tank atomizer in this vaping kit has a 5.5 ml capacity is top filling and features an easily adjustable air flow regulator. This A-Box Mini Vaporizer Kit by Rofvape comes with 12 months warranty, brought to you by the leader in electronic devices as well as wholesale vaporizers and e-cigarettes..